Out in the green is where city dwellers long to be on sunny summer days. With temperatures being pleasant, but still far from hot, I seized the opportunity over the last two weeks to lace up my hiking boots, and to take to the trails on both sides of the Atlantic. While the joy was constant, in other aspects differences became obvious. In Canada, my Dutch friend and I headed to Frontenac Provincial Park, located between Kingston and Ottawa in south-eastern Ontario, where on a balmy Saturday we had picked a pleasant looping trail, said to take about 5 hours to hike. Having paid our park admission, we set off into a pristine landscape of bogs and marshes, accompanied only by the song of a few birds, and the constant hum of countless insects. Fortunately, I'd come prepared with plenty of locally-purchased, DEET-laden insect repellant (I'd found out the scratchy way that the spray I'd brought from Europe was useless), and much to my delight Ontario's bugs seemed much more attracted to Dutch blood anyways. The landscape was surprisingly varied, and fortunately small snakes remained the only wild animals we saw - the bears must have been out at the mall. Most strinkingly, despite the park being easily accessible and this being a perfect Saturday, we only came across one single other person in all of our hike. Other than that, we had the trail to ourselves and enjoyed the sensation of being truly out in the wild - no human structures could be seen at all. The same could not be said a week later, when my former flat-mate joined me for a day-trip to Ticino, escaping the chilly rain of northern Switzerland for some southern sun. We'd picked a panoramic route along a mountain ridge, located precisely over the site of our family cottage, where I'd spent a good part of my childhood holidays raiding my nonna's larder for local specialties. Back then, the trip to Ticino seemed like a long journey into a different world. This week, we zipped down from Zurich in what felt like just another little drive down to Kingston. Scenic and well-known as it is, I was expecting a few other hikers to join us on the trail, but this being a Monday outside typical vacation period, I wasn't quite ready for the crowds we found. I'd obviosly been away from the tiny country and its 8M inhabitants for too long - there seem to be no unpopulated spots left, hiking trails being no execptions. From the base of the hill to the shuttle bus taking us back to the starting point in the evening, others were constantly in visual (and sometimes olfactory) range. 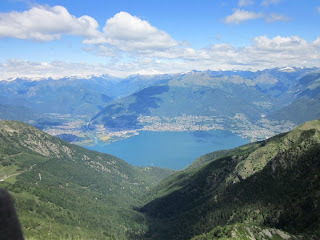 The views, down both sides of the mountain onto Lago di Lugano as well as Lago Maggiore were stunning, of course. But they too are testimony to just how crowded Switzerland is: Roads, rails, homes, churches, boats, sail planes and even a hydro dam were plainly visble as we made our way along the trail. At no time was one under the impression of being really in the wild. Our vantage point atop the hills revealed just how close to each other the various cities are: The day-long journeys of my childhood to any one of them had become a quick 50km run up or down a valley. On the summit of Monte Tamaro, I realized that my sense of space has most definitely changed. Leaning back against the summit cross on Monte Lema, the end point on our route, I let my eyes wander over the landscape laid out in front of me, from Lugano all the way into Italy. I spotted the causeway across the lake at Melide, the site of a theme park called Swiss Miniatur. And smilingly, I mused - doesn't this apply to the entire country anyways?